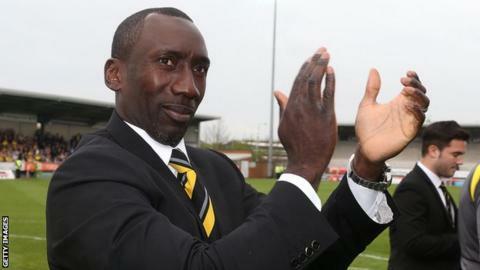 The Football Association's new Black, Asian and Minority Ethnic boss Wayne Allison wants to boost the number of black coaches by ending a "silo mentality" in English football. A recent report by the Sports People's Think Tank found 23 out of 552 elite coaching roles are held by BME people. The former striker, 47, will lead a £1.4m plan which aims to unite clubs and authorities to combat the problem. "The rate of change has not gone as quickly as possible," said Allison. "Football authorities working in silos hasn't worked, so if it's a co-ordinated and unified process I think we have a chance of moving things forward more quickly." In his newly appointed project manager role, Allison will attempt to bring together the Premier League, Football League, Professional Footballers' Association and League Managers' Association after the FA's investment over the next five years. Part of his agenda will be an attempt to increase the number of BME coaches and managers at elite level, with only six bosses currently working in the top four divisions in England. The appointment of Allison, who earned a PhD from Sheffield Hallam University in 2010, comes after the Football League said it planned to introduce a version of the "Rooney Rule" from the 2016-17 season. Under new proposals, clubs must interview at least one BME candidate for all youth development roles requiring a minimum of a Uefa B coaching licence, and five to 10 clubs will pilot a "Voluntary Recruitment Code" for first-team jobs. That includes jobs being openly advertised, defining specific criteria for the role and consulting a "ready-list" of potential candidates. Allison - who made over 750 league appearances with Halifax, Watford, Bristol City, Swindon, Huddersfield, Tranmere, Sheffield United and Chesterfield - hopes that Premier League clubs will also take on similar recruitment methods. "If all clubs adopt the Voluntary Recruitment Code we will be in a better place," he added. "There are still no guarantees, but it might shift and change mindsets. We are asking them to consider it, we can't force them and it would be wrong to do so. "It's a case of the league helping itself. We can help but we have all got to show the responsibility and if we do that we are in a stronger position." What is the "Rooney Rule"?